Crazy as it seems, now we’ve finished celebrating one of the hottest summer solstices on record, it is time to start planning for office Christmas Parties. For months they’re the talk of the workplace, whether good or bad, so it is important to get it right. But don’t despair – we’ve got you covered. Even if you’re a small company there is no harm in thinking big. You don’t have to compromise. Merlin Events London offers an incredible selection of shared office Christmas Parties to suit every budget and size. What are the latest trends to consider? Venue Search London’s second London Christmas Party Survey was presented at London Christmas Party Show, and it identified trends of 59% of parties still opting for the more formal seated lunch or dinner catering style, with Thursday and Fridays accounting for 69% of the total market. Interestingly they also found an increasing trend towards lunchtime events, which now represent 21% of the total Christmas party market (up from 18% in 2016). 55% of parties are now held at restaurants, bars and clubs (up from 52% in 2016), with 40% of buyers opting for tables at Shared Party Nights or in restaurants. According to Paragon set design is also becoming increasingly popular – whether it’s an alpine ski lodge, set from love island or moonscape, people are looking for more than just a venue. Themed parties are also set to be on trend in 2018. Echoes from the Olympics are still set to continue with carnival or samba-themes adding atmosphere, party spirit and great costumes. And people want creative gourmet food. Trends this year include farm to fork – why not highlight how far away your food has been sourced? Alternatively American snacks including pulled pork, sliders, mac and cheese are also appreciated and popular due to their booze soaking up abilities! Catering to all these trends, Merlin Events London has got a range of packages across our 3 top attractions. Madame Tussauds offers red carpet glamour from a prosecco reception with Eddie Redmayne and Tom Hardy to meeting King Kong in the jungle, and then joining the royals and other celebs in the World Stage Ballroom. 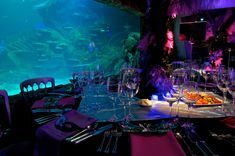 At SEA LIFE London Aquarium you’ll get to drink your prosecco accompanied by beautiful marine life before being greeted by the divers in the shark tank and then partying all night long, under the sea. What The London Dungeon lacks in glamour it makes up for in fearful giggles! Starting with the Gin Palace, our photographer will capture your most ghastly poses, before you’re taken on an immersive theatre tour through London’s darkest history. Jack the Ripper, Mrs Lovett and Sweeny Todd will be waiting to give you a festive greeting, so beware! When it comes to catering, we’re proud to partner with one of London’s finest event caterers Food by Dish to bring you the latest, most creative and tantalising party food. So whether you’re a small office looking for a quirky Christmas party, or a group of friends organising your annual get together it is worth seeing what we offer. Not only have we got the most unusual and fun locations in the City, but we’ve also amassed a wealth of party experience. You can count on us to make all your office Christmas Parties memorable – for the right reasons! 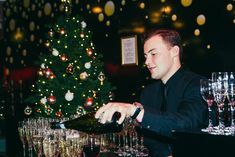 Why not book your shared office Christmas Party tickets now?